Well, we've been talking about doing more videos for a while now and we finally did a couple. The one we are sharing with you today is a "What's in my Purse?" video. Let me tell you what, our purses are a mess! Actually, doing this video practically forced us to clean our purses out so NOW, they are clean. 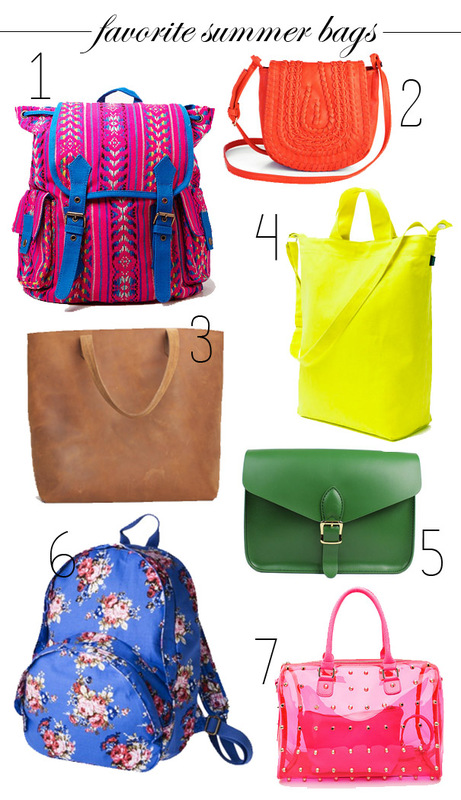 Since this video involves our purses, I figured I'd put together a post with some of my favorite summer bags. Summer is all about ease, and that's exactly what I want from my bags in the summer. I want something with easy access that is easy to carry. This summer I've been into cross-body bags and large tote bags. And, since it is summer, you can get away with bright colors and bold patterns. Anyways, check out our video below! And if you have any suggestions about types of videos we should do, let us know by leaving a comment! I like your bangs, Savannah. Very chic.